Listen: Sam & Duncan check in with brekky producer Ally Barnes about her adventures in motherhood. Ever since Breakfast producer Ally Barnes went on maternity leave in mid-June, the listeners of ‘Hopeland’ have been wondering about the birth of Baby Barnes. The wonderful news is that Banjo Halvor Barnes entered the world on the morning of Friday, July 13. Ally and her husband Sean are over the moon and so in love with their baby boy. Hope Breakfast duo Sam and Duncan phoned Ally to see how motherhood is going, and they were happy to hear it’s been a smooth transition for the Barnes family. Ally said she couldn’t wait to introduce Banjo to the Hopeland team and was thankful for her “incredibly amazing” husband Sean who, so far, does every nappy change. 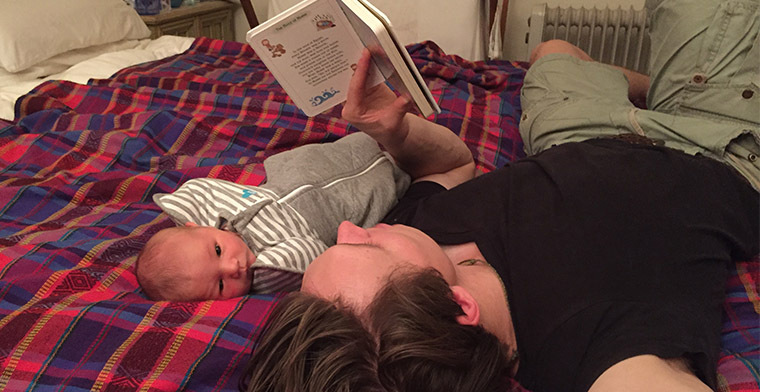 Above: Sean Barnes making sure Banjo starts developing his reading skills nice and early.